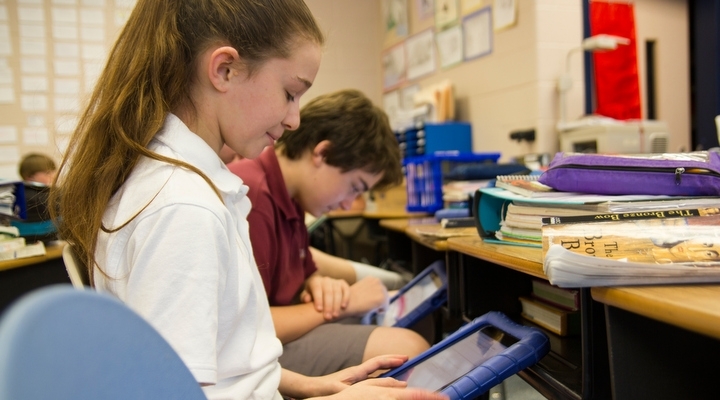 The hallmark of our Middle School technology program is our 1-to-1 iPad program in which every student in Grades 6-8 is issued a school-owned iPad which they use in class and at home. Students use these iPads in their classes to take notes, make flashcards, participate in class discussions, manage their agenda, create presentations, and many other exciting uses. In addition to the 1:1 middle school program, Grades K-5 have a portable carts with a class set of 30 iPads for classroom use as needed. The Technology Program at School of the Incarnation insures that our graduates are technically proficient and well-prepared for high school and beyond.